Most people have heard of the Norman Conquest of 1066, but the Danish conquest of 866 made just as great an impact on the North. 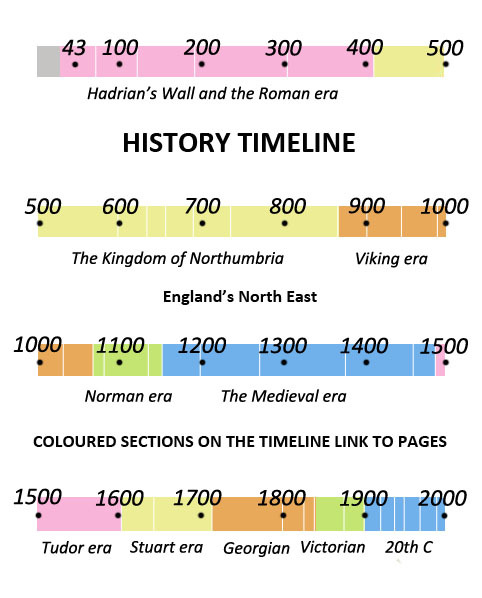 The Danes brought cultural, linguistic and political changes to the North and made southern Northumbria the Danish Kingdom of York which they divided into three 'ridings'. In Northern England, the Danes settled mainly in Yorkshire while the land north of the Tees remained largely Anglo-Saxon. Many Danish place names survive in Yorkshire today like Thornaby, Wetherby and Danby, but the most important Viking settlement in England was, of course, the city of York. Osbert, King of Northumbria, is overthrown by his people and replaced by his brother Aelle II. A Danish army of around 10,000 men invades East Anglia where it encamps for the whole winter. The Danes are led by Ivar the Boneless (so called because of his lanky, gangling appearance) along with his brothers, Halfdene and Hubba. The Danes have taken advantage of turmoil in Northumbria and crossed the Humber into the Deiran province of Northumbria (Yorkshire). York is sacked by the Danes under Ivar, Halfdene and Hubba. Aelle of Deira and Osbert of Bernicia unite against the Danes. Aelle, King of Northumbria, is captured attempting to retake York from the Danes. Earl Osbert of Bernicia is killed during the battle. Aelle is subjected to the horrific Blood Eagle ordeal by the Vikings. His ribs are torn out and folded back to form the shape of an eagle's wings. 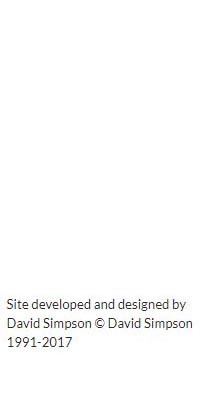 It is punishment for his alleged murder of Ragnor Lodbrook, a great Danish leader who was the father of Ivar, Halfdene and Hubba. 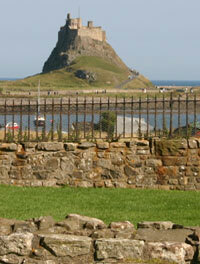 The Danes employ an Anglo-Saxon called Egbert as temporary King of Northumbria. The Danish army returns to York following an excursion into the Midlands where it captured Nottingham. The Bernicians of North Northumbria reject the appointment of King Egbert and hope to replace him with a nobleman called Ricsige. Viking leader Ivar the Boneless dies in Ireland. He is succeeded by his brother Halfdene at York. Eardwulf, Bishop of Lindisfarne, leaves Norham on Tweed with the Community of St Cuthbert carrying St Cuthbert's coffin to escape the anticipated Danish attacks. The community settles in Cumbria where Eadred, the abbot of Carlisle, becomes its new leader. Halfdene becomes King of York (Yorkshire) on returning from a victory over the Mercians. The old Anglo-Saxon estates in Yorkshire are to be shared out among his army and followers. Yorkshire will be divided into the three Ridings (thrithings or thirds) w hich can be defended by three military divisions of the Danish Army based at York. None of the Ridings is further than a day's ride from York. The Danes, under the leadership of Halfdene, enter the Tyne and destroy Tynemouth Priory before wintering at the mouth of the River Team near Gateshead. Once the winter is over the Danes begin their battle campaign in Bernicia and Scotland. Hexham is ransacked. Bernicia north of the Tees (Northumberland and Durham) is defeated by the Danes but generally escapes Danish settlement. 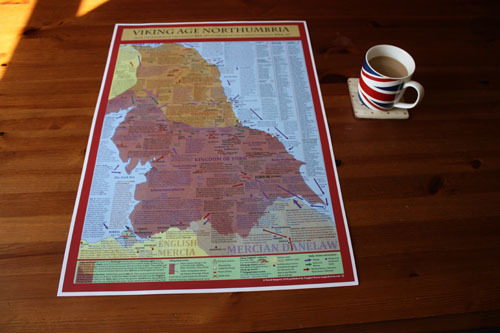 There will be pockets of Danish settlement here and there, particularly in southern Durham around Sadberge and Gainford, but most of the region remains Anglo-Saxon and will continue to speak the Anglian language, though with some Viking influence. Descendants of the old Kings of Bamburgh continue to rule the North East region but as clients of the Danish Kings of York. One half of the huge Danish army under Hatfdene is settling in Yorkshire while the other half is taking control of the East Midland shires of Derby, Nottingham, Leicester, Lincoln and Stamford. The East Midlands is known as the Danish Five Boroughs. The West Midlands remain Anglo-Saxon. Halfdene, the Danish King of York, has been killed in battle in Northern Ireland fighting a rival faction of Irish Norsemen from Dublin. Alfred the Great of Wessex defeats a Danish army under the leadership of Guthred. Abbot Eadred of Carlisle, the leader of the Communuity of St Cuthbert, has supported the claims of Guthred the King of York to the Northumbrian throne. Guthred the new Danish King of York, has granted an area of land between the Tyne and Tees to the Community of St Cuthbert, which recently fled to Cumbria. The grant of this land signifies the beginning of what will later become County Durham. The Community of St Cuthbert has settled within this territory at Chester-le-Street (Conecaster). Their territory will be called the Land of the 'Haliwerfolk' - meaning the holy man people. St Cuthbert's body is interred in a new church at Chester-le-Street. Eardwulf the former Bishop of Lindisfarne becomes the first Bishop of Chester-le-Street. Guthred, the Danish King of York has died. Death of Alfred the Great.